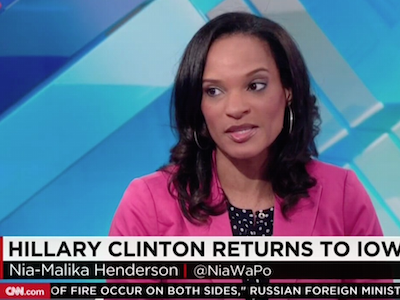 WaPo's Nia-Malika Henderson joins CNN as their newest senior political reporter in anticipation of their 2016 coverage. As they continue to gear up for their 2016 presidential campaign coverage, CNN has nabbed The Washington Post‘s Nia-Malika Henderson as their newest senior political reporter. Henderson, a frequent face on “Meet The Press,” Fox News, MSNBC and PBS, will now exclusively appear on CNN. She will report on the 2016 campaign as a whole, but will have a special focus on “identity politics,” including demographics, race and religion. I am thrilled to announce that Nia-Malika Henderson will join the CNN Politics Digital team as a senior political reporter. Nia, a staff writer at The Washington Post, is already a valued member of the CNN family as a frequent contributor on our air. In her new role, she will report broadly on the 2016 campaign for CNN’s digital and television platforms. She will also carve out a special focus covering identity politics — exploring the dynamics of demographics, race and religion, and reporting on the groups of people who help shape national elections. Nia brings great insight and authority to this coverage and will build on her work at the Post covering the intersection of politics with culture and demographics. She starts April 6. Please join me in welcoming her to the fabulous CNN Politics team.